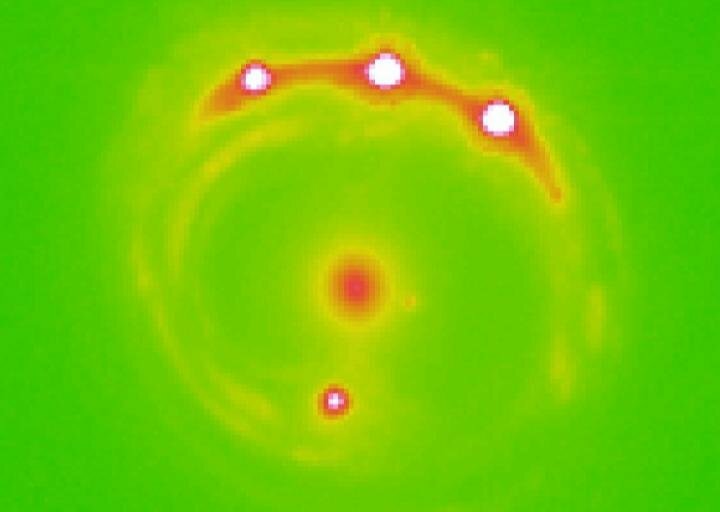 Using a technique called microlensing, astronomers detected 2,000 planets beyond the Milky Way, ranging in sizes as small as Earth's moon and as big as Jupiter. Astronomers just found the first possible planets ever seen outside of the Milky Way, which is the galaxy in which Earth and our solar system reside. This marks a new milestone in planet-searching. Scientists have already found more than 3,700 planets in our own galaxy through observatories such as the prolific planet-hunting Kepler space telescope. But, using a rare technique researchers identified planets that are much further away. Usually astronomers find planets through one of two ways: watching a planet dim the light of a star as it passes across the star — the transit method — or watching a star wobble due to planets orbiting around it — the radial velocity method. The planets outside of our galaxy were instead found using a technique called microlensing, which involves two moving stars or objects aligning from the vantage point of Earth. The objects' gravitational interactions focus the light of the planet, making the planet briefly brighter and more visible. "Microlensing is the only known method capable of discovering planets at truly great distances from the Earth," the Planetary Society said in a statement. Radial velocity searches generally only work for planets that are very close to us, at up to 100 light-years away. But microlensing "can find planets orbiting stars near the center of the galaxy, thousands of light-years away," the society added. Turns out the search also works for planets outside of our galaxy. University of Oklahoma astronomers Xinyu Dai and Eduardo Guerras found the planets using a quasar — a bright object powered by a huge black hole — roughly 6 billion light-years away from Earth, called RX J1131-1231. Astronomers used NASA's Chandra X-ray Observatory to probe for planets in a galaxy a little closer to us — roughly 3.8 billion light-years away — using microlensing from the quasar. The result was astounding. The quasar's light revealed 2,000 unbound planets moving between the galaxy's stars. These planets range in size from Earth's moon to the planet Jupiter. "This is an example of how powerful the techniques of analysis of extragalactic microlensing can be. This galaxy is located 3.8 billion light years away, and there is not the slightest chance of observing these planets directly. Not even with the best telescope one can imagine in a science fiction scenario," said Guerras in a statement. "However, we are able to study them, unveil their presence, and even have an idea of their masses. This is very cool science." The study was published in journal Astrophysical Journal Letters, and it's not the first time gravitational microlensing uncovered an interesting object. Back in 2014, a chance alignment between two stars revealed a possible exomoon — a moon orbiting an exoplanet. Astronomers said the system, called MOA-2011-BLG-262, is either a planet and a moon, or a star and a planet. Unfortunately, astronomers can't do follow-up observations and confirm if the exomoon really existed. This microlensing came from a chance alignment between two stars that won't be repeated. But if it was an exomoon, it was the first one ever discovered. "We won't have a chance to observe the exomoon candidate again," stated lead author David Bennett of the University of Notre Dame, in a 2014 statement. "But," he added, "we can expect more unexpected finds like this."